Forge Motorsport Blow Off Dump Valve Kit VAG 1.4T 1.8T 2.0T FSI + TSI FMFSITAT. (the 1.4T needs additional fitting kit FMBGFK3). Found in a wide range of vehicles from VW and Audi. (polished silver) or (black anodised) If no note is added a polished silver dump valve will be sent as default. This valve, part number FMFSITAT, is a hybrid of sorts, that combines our existing full replacement solenoid controlled recirculating valve with our blow-off valve adapter. The result is a full replacement atmospheric blow-off valve that integrates seamlessly with the OEM electronics and results in absolutely no fault codes, no check engine lights, and no detriment to the performance of the vehicle in any way. Like our full replacement recirculating valve option, the FMFSITAT is fully engineered to remedy the failure issues experienced with the OEM solenoid valves when their diaphragm may rupture which would effectively result in a boost leak. Our valve uses full billet alloy construction with a piston based internal design that provides for significantly improved reliability over the OEM valves along with lightning fast response. This valve is particularly well suited to the B7 and B8 chassis Audi A4 and A5 with the 2.0T engine. The valve mounting location on these vehicles is positioned particularly close to the frame rail of the chassis, and the overall installed height of our standard replacement valve and spacer combination is such that it conflicts with the chassis at this location. The FMFSITAT valve has a much shorter overall installed height, which enables fitment of this atmospheric valve option onto the B7 and B8 chassis whereas this was previously not an option. Another particularly unique feature of this product is the included intake manifold tap used to source a vacuum reference for the operation of the valve. This piece also has two other available provisions from which an intake manifold reference can be taken. These extra manifold references can be used for a boost gauge signal, and even a water/meth injection trigger where applicable. Note: This will ONLY fit the 1.4 turbo engines up to early 2013, where the turbo is mounted at the front of the engine bay. It will not fit engine codes CMBA & CXSB. 1 x Solenoid, Bracket, and Screws. 1 x PCV Adaptor Kit. 1 x Blue Spring (Uprated). 1 x 2000mm Length of 4mm Vac Hose. 1 x Forge Keyring and Sticker. Audi A3 2.0 TFSI Turbo + Quattro 200BHP. Audi A6 2.0 Fsi Turbo 211HP. Audi S3 2.0 Turbo Quattro 8P 256 265BHP. Audi TT MK2 2.0 Turbo. Audi TTS MK2 2.0 Turbo. Audi A3 1.4 Turbo 125BHP. REQUIRES FMBGFK3 FITTING KIT TO INSTALL. Seat Leon 1.4 Turbo 125BHP. Seat Leon 2.0 Turbo (LEON CUPRA R 265). Skoda Octavia 2.0 Turbo. Vw 2013 Beetle 2.0 Petrol. Vw Golf Mk5 1.4 Turbo 140. Vw Golf Mk5 GTI 2.0 Turbo 200 BHP. Vw Golf Mk5 GTI Edition 30 230 BHP. Vw Golf Mk6 1.4 Turbo. Vw Golf Mk6 GTI ED35 2.0 Turbo. Vw Golf MK6 R 2.0 Turbo. Vw Passat 1.8 / 2.0 Fsi Turbo. Vw Scirocco 2.0 turbo. If you wish to tune this product to fit the needs of your engine, please see the spring tuning kit. The item "Forge Motorsport Blow Off Dump Valve Kit Golf MK6 R Scirocco Turbo R FMFSITAT" is in sale since Wednesday, May 23, 2018. This item is in the category "Vehicle Parts & Accessories\Car Tuning & Styling\Air Intake & Induction\Dump, Bypass & Blow-Off Valves". 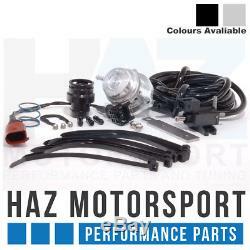 The seller is "haz_motorsport" and is located in Dewsbury.